SHE SAID SHE’D do it, and she’s done it. 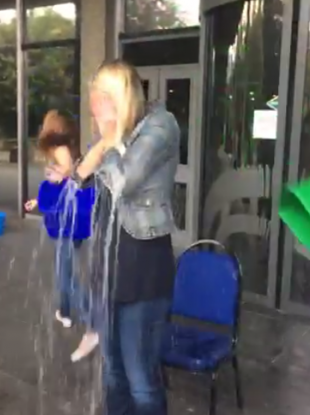 RTÉ journalist Sharon Ní Bheoláin has completed an ice bucket challenge after she was challenged by her colleague Jenny Greene. Ní Bheoláin said that if she surpassed a fundraising target of €1,000 for the Irish Motor Neurone Disease Association she’d fulfill her side of the deal and subject herself to an icy drenching after reading the Six One news. She actually raised more than double that (€2805 at the time of publication). According to the 2FM Twitter account the drenching will make it onto the nine o’clock news tonight. Email “Sharon Ní Bheoláin films ice bucket challenge for Nine O'Clock News”. Feedback on “Sharon Ní Bheoláin films ice bucket challenge for Nine O'Clock News”.